After five nights of competition, we have finally found the winner of the Sanremo Festival. Francesco Gabbani is the winner of the historical music festival and, as RAI has confirmed, the Italian representative in the upcoming Eurovision Song Contest. 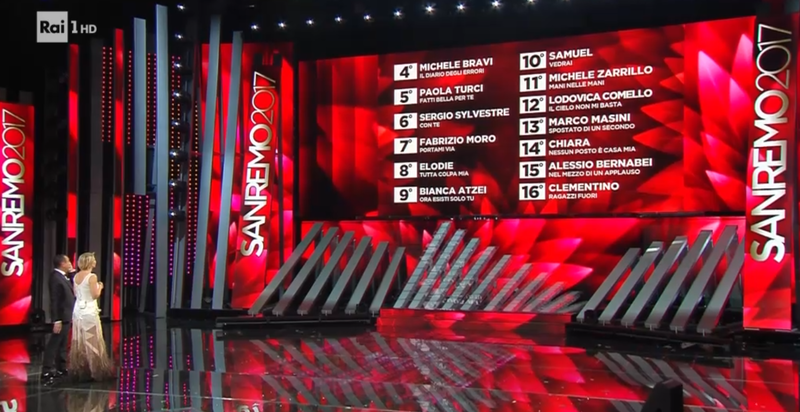 As always, Italy’s Festival di Sanremo has been an exciting music competition, which was deservedly won by artist Francesco Gabbani. The Italian broadcaster RAI comfirmed some minutes after his victory that Francesco Gabbani will be their artist to Kyiv with the same song Francesco won in Sanremo Occidentalis Karma. This being Sanremo, the fun song is sung in Italian but contains a few lines in English as well as the occasional phrase in Latin, Hindi and, it would seem, even ancient Greek. 🎤🎉#Sanremo2017 #Eurovision [email protected] !🐒 Congratulazioni Francesco Gabbani!Let's go and rock Kiev! Carlo Conti and Maria de Fillipi hosted the final night of the festival and – again – welcomed many big names on stage: Zucchero, Alvaro Soler, Rita Pavone, Carlo Cracco, Alessandra Mastronardi, Diana Del Bufalo, Giusi Buscemi, Geppi Cucciari, Enrico Montesano, Paolo Vallesi, Amara, Emanuele Fasano,Tina Kunakey and Vincent Cassel formed a long list of well-known Italian and international celebrities. You can watch all the live performances of the final of Sanremo, in the official page of the festival. Tonight was the big night. The five day long 67th “Festival Della Canzone Italiana” came to an end and we have at last, the winner of the historical festival. They will now have to decide if they will represent Italy in the Eurovision Song Contest 2017 in Kyiv in May. Maybe! Forse!. Carlo Conti and Maria De Filippi were hosting. Zucchero and Alvaro Soler performed as guests. Paolo Vallesi and Amara presented their song Pace that didn’t make the cut of the 22 Big. Maurizio Crozza, Enrico Montesano and Geppi Cuccari were the comedians of the night. Rita Pavone, who was also a member of the jury,recieved an award for her life long career in the Italian music scene. As before, the result was determined by the familiar 3-way method of televote, expert jury (Giorgio Moroder (head of jury, Italian composer and producer), Linus (radio DJ), Andrea Morricone (composer and conducter), Rita Pavone (singer), Paolo Genovese (director and screenwriter), Violante Placido (actress and singer), Greta Menchi (YouTuber) and Giorgia Surina (presenter) and demoscopic jury. Winning the Sanremo Festival gives the winning artist the opportunity to represent Italy at the Eurovision Song Contest. Nevertheless not every artist who won the Italian music competition was willing to enter the big international contest. That can be explained by the fact that Sanremo is a festival on its own. It existed before the first edition of Eurovision and probably would further exist without the international event. As a consequence some artists enter Sanremo just for the purpose of winning the traditional Italian festival, without necessarily thinking about the Eurovision Song Contest. Last year’s winner Stadio refused to go to Stockholm, giving their spot to Francesca Michelin. Below you can watch their winning entry Un Giorno Mi Dirai: Do you think they would have been the better choice? And do you think that this year’s winner is going to represent the country in Kiev? Let us know in the comments or respectively on social media.